It's time for another episode of 205 Live on the WWE Network! Tonight, TJP gets a rematch against Noam Dar after the Scottish Supernova got a quick win over him a few weeks ago. Also, the challenge of Lio Rush is met when he faces Akira Tozawa. Will Rush make a name for himself and his future, or will Tozawa knock some sense into the young cocky upstart? Tune in for all the details. Hit F5 to refresh the live recap! We start out with Drake Maverick recapping last week's 205 Live where Cedric Alexander successfully retained his Cruiserweight Championship against Hideo Itami, and says that he will address Cedric's next challenger later tonight. Maverick mentions the main event of Lio Rush taking on Akira Tozawa and hypes it up. He says the opening contest will be TJP facing the recently returning Noam Dar, who surprised him in their first encounter two weeks ago. Cue the opening! Tonight, 205 Live is in Wilkes-Barre, PA. Vic Joseph asks if Lio Rush deserves the main event spotlight, Nigel McGuinness answers that it doesn't matter, and Percy Watson adds that he has to show and prove he does. First up, TJP comes out for his match. TJP: "Ohh, what a treat. Drake Maverick is gracious enough to tell me who my opponent is beforehand. I feel so spoiled, I even came out to entrance music and I got to pick what gear I wanna wear! It's pretty much Christmas around here. No but iff it were I know what I want. I'd throw my name out there for the next title opportunity, but Drake Maverick probably wouldn't listen. No, he prefers me to be a curtain jerker in this diaper storm of a town, Wilkes-Boring. Seriously, do you guys actually admit that you're from here, or do you say you're from Philly? (Boooo.) But I gotta give credit to my opponent. Noam Dar just came back from a tragic knee injury and he looks great. At least this match is gonna be twice as handsome as if I were to wrestle one of you. But unfortunately for Naom Dar, I'm gonna turn his little comeback story into a comeback sentence. While some things have changed around here, one is constant and that's me. I'm still the CruiserGreat, and I'm still the best technical wrestler in the game." TJP charges at the bell, Dar side-steps him, soccer kicks him in the leg, goes for the finish, but TJP smartly ducks out the ring. Dar surprise attacks him on the outside, hits a couple forearms, throws him back in, ducks a swing, back suplex slam, and covers for 2. TJP swings through the ropes, slides back in, rear waistlock, Dar switches, TJP switches, double-leg takedown, Dar blocks a submission attempt, TJP rolls him up into an armbar, Dar counters, and TJP reaches the bottom rope. TJP pulls him into the ropes, hits the springboard basement dropkick, throws him into a turnbuckle, hits a European uppercut, chokes him with his boot, and we see Drake Maverick looking on backstage. TJP continues the attack with kicks, European uppercut, body slam, slingshot senton splash, covers for a 2-count, picks his leg, delivers a northern lights suplex, floats over into the tequila sunrise, Dar fights him off his legs, so TJP wrenches both arms backwards - one hammerlocked and the other in a double wristlock. Dar has to reach the ropes with his feet to break the hold. Dar fights back with forearms, TJP hits back, Dar with a backslide for a near-fall, TJP counters with an armbar, Dar rolls through, TJP put him in a deathlock, switches to a hammerlock and snaps the other arm back. TJP delivers a suplex, spins around back up, back suplex, covers for a 2-count, locks his legs ina grapevine and applies a double wristlock. Dar rolls him up inside cradle for 2, charges, ducks under him, ducks to avoids a running crossbody, runs into his boots, and kicks his legs from under him on the middle ropes. He hits headbutts, an uppercut, running uppercut, northern lights suplex, and gets a 2-count. TJP picks him up for the Detonator Kick, Dar slips off, legsweep, clotheslines him from behind after missing from the front, covers for 2, backs to a corner, charges, TJP rolls out the way, Dar goes after him, TJP rolls him up inside cradle for 2, picks him up again, Dar slips off again, TJP drop toeholds him into the ropes, goes for the springboard baseball dropkick, but Dar avoids it and dropkicks him in the side of the head. Dar gets fired up, TJP throws him into the barricade, both are back on the apron, TJP blocks a suplex and kicks him in the sugically repaired knee. TJP grabs his knee, Dar kicks him away, rolls back in the ring gingerly, TJP with a chopblock, stomps on his knee, throws him down, puts him in the single leg Boston crab in the ropes, and Maverick is still looking on. TJP stands on his foot, locks in the Clutch Kneebar and Dar taps! WINNER: TJP. The commentators hype this up as an important victory for the first Cruiserweight Champion. We now switch to the current champion and get a video package for last week's Cruiserweight Championship match. Next we get a video package for Mustafa Ali talking about winning his match against Buddy Murphy and says he won't stop fighting until he is the next Cruiserweidght Champion. Drew Gulak comes out for a match, and The Brian Kendrick and Gentleman Jack Gallagher accompany him to the ring. Gulak's opponent for tonight is Danny Garcia. Kendrick and Gallagher clap for their friend as he makes his entrance, then they finally exit the ring. The bell dings, Gulak clotheslines him, hits a backdrop driver, applies the Gulock, and that man passes out. WINNER: DREW GULAK. Gulak is pleased with his work, as are his buddies. Gulak: "Well you can't always get what you want, but if you try sometimes you might get what you need. Normally I'm not one for the rock'n'roll, but Mick Jagger does make a salient point. You, the 205 Live universe, have been subjected to two years worth of unworthy champions, but not anymore! Now you'll have a champion you'll find you need - ME. 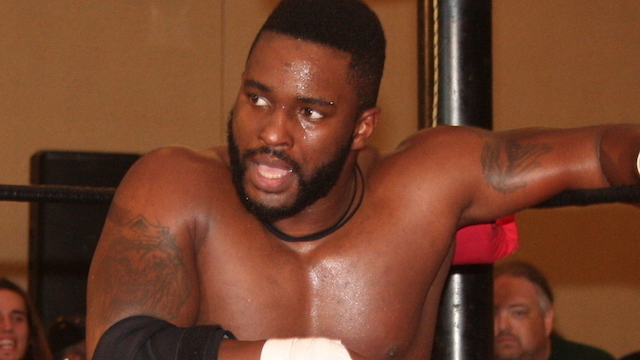 Speaking of champions, you remind me of Cedric Alexander, not physically of course. You remind me of Cedric because when you step to me, you will tap out." We get clips from last week where Buddy Murphy attacked Kalisto during his match with Tony Nese, and that turned into a brawl with all of The Lucha House Party involved. The LHP stood tall while Nese had to hold Murphy back. Backstage, Dasha interviews both Nese and Murphy asking Murphy what made him lose his cool. Murphy answers that he doesn't like to lose, says "The Luchas were the wrong guys in the wrong place at the wrong time" and tells her that the only things he regrets is that Nese didn't get to showcase to the world that he is a premiere athlete. Nese issues a challenge to Kalisto one-on-one next week and adds that everybody else should be left behind. Both men are oddly smiling at each other before the match starts. We're underway, Rush tells Tozawa the people love him as they chant with him, they tease a lock up, nothing, tease another, and Rush is all talk playing games with him. Rush puts him in a side headlock, Tozawa pushes off, Rush floats over in a corner, Tozawa does a drop-down, Rush runs around the ring, slides under a big boot, does a springboard hurricanrana, and gloats about it on the ropes. Maverick looks on backstage and shakes his head in disbelief, but maybe a little impressed. Tozawa goes after him but Rush quickly rolls out the ring, then gives chase on the outside and back into the ring, ducks a swing, Rush with a sunset flip, Tozawa rolls through, kicks him in the chest, lands a standing vertical senton, and gloats on the ropes as well! Rush gets offended, Tozawa side-steps him, chops him in the chest, another chop, Rush tosses him onto the apron, clubs him on the back, does a handspring kick to knock him off the apron, and tries to recover from the chops. Tozawa gets back in the ring at 8, Rush clubs him on the back, stomps him in the head and chest, kicks him down, delivers a suplex, Tozawa kicks out at 1, and Rush kicks him in the back. Tozawa fights back, Rush punches him back with forearms, hits a running back elbow, hits an elbow drop, and another, then puts him in a rear chinlock. Tozawa gets back up, fights out, chops him, blocks another chop, evades the jabs and punches, hits quick palm strikes, forearms, a kick is caught, backflips, and Tozawa lands the jab! Tozawa with a back kick, misses the spin kick, sprawls through the legs, connects with the spinning kick to the head, then hits the suicide diving headbutt sending him into the announce table! Tozawa throws him back into the ring, climbs up top, hits a missile dropkick, covers for 2.5, struggles back to his feet, caches Rush's leg, but Rush is the one with a quick strike knocking Tozawa's mouthpiece out. UH-OH, bad move! Tozawa delivers a snap side suplex, climbs up top, calls for the finish, but Rush rolls out the ring, Tozawa wants a suicide dive, but Rush covers up, so Tozawa goes after him, avoids the stairs, grabs Rush's leg as he tries to get back in the ring, and Tozawa just punches him on the noggin. Tozawa hits a kneelift from the apron, goes back up top, Rush pulls his legs from under making the BACK OF HIS HEAD smack against the top turnbuckle, goes up himself, hits The Final Hour frog splash and gets the 1-2-3! WINNER: LIO RUSH. Nigel McGuinness is wildly amazed at the victory. We get several replays from the ending and afterwards he's still bragging. Tozawa is holding his ribs while staring down the man who beat him. Drake Maverick is still watching on the monitor until Cedric Alexander approaches him about his next challenger. Maverick tells him that he's thought about it all night, praises the talent, and announces that next week it will be Drew Gulak vs. Hideo Itami vs. TJP vs. Mustafa Ali in a fatal 4-way match. Cedric likes it, says "May the best man win" and walks off. That's all for 205 Live!